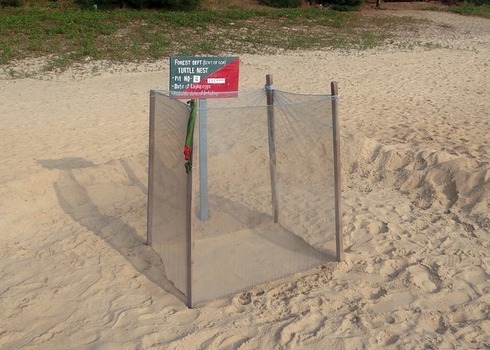 Nets protecting turtle nests. Goa, India. In-situ conservation is one of two basic conservation strategies, alongside ex-situ conservation. Article 8 of the Convention on Biological Diversity (CBD) specifies in-situ conservation as the primary conservation strategy, and states that ex-situ measures should play a supportive role to reach conservation targets. In-situ conservation aims to enable biodiversity to maintain itself within the context of the ecosystem in which it is found. In-situ management approaches can either be targeted at populations of selected species (species-centred) or whole ecosystems (ecosystem-based). Traditionally, protected areas have been seen as the cornerstone of in-situ conservation. Conservation approaches that are more adaptable to individual situations and applicable beyond protected areas, are being increasingly applied. In-situ (‘on site’, ‘in place’) conservation is a set of conservation techniques involving the designation, management and monitoring of biodiversity in the same area where it is encountered. The in-situ concept is best understood in contrast to ex-situ conservation. Ex-situ (‘off site’) conservation techniques are implemented away from the conservation target's natural habitat. While the identification of ex-situ initiatives leaves little room for ambiguity (e.g. zoos, seed banks, captive breeding), the notion of in-situ conservation covers a broad spectrum of situations ranging from the establishment of a protected area to the design of a sustainable management strategy for a particular habitat. In-situ management approaches can either be targeted at populations of selected species (species-centred approaches), or whole ecosystems (ecosystem-based approaches) 2. Both approaches follow the same purpose: To enable biodiversity to maintain itself within the context of the ecosystem in which it has been found, ie. to enable a species population to self-replicate and maintain its potential for continued evolution 3. This requires conservation of the components of the natural system (populations, species, communities and biophysical systems) as well as the ecological and evolutionary processes occurring within that system. Conservation measures are aimed at the surroundings where a target-species developed its distinctive properties. This could be a natural habitat, or an environment heavily modified by human activity. For instance, agricultural or domestic species may have evolved characteristic traits in human dominated environments. The conservation of agricultural biodiversity therefore requires the conservation of agro-ecosystems by farmers, commonly using traditional farming practices 2, 4. Implementation of the regulatory, legislation, management or other frameworks needed to deliver the protection of species or habitats. Historically, in-situ conservation was the preferred biodiversity conservation approach over ex-situ conservation 10. In-situ measures are perceived as more holistic in their approach and allow the conservation of processes or habitats which can’t be protected through ex-situ measures (e.g. soil microbial processes, evolutionary processes, specific ecosystems such as coral reefs or species with highly specialised needs). The Convention on Biological Diversity (CBD) recognizes the complementary role of both conservation strategies (in-situ and ex-situ). Article 8 and 9 of the CBD set out guidelines for the use of in-situ and ex-situ measures, respectively. In particular, the CBD specifies that ex-situ facilities and techniques should predominantly be implemented for the purpose of complementing and supporting in-situ measures 11. Lacy R (2010) Re-thinking ex situ vs. in situ Species Conservation. Proc. 65th World Aassociation Zoos Aquariums Annu. Conf. Col. Ger.